Himself certified as both a Master Hypnotist and a Master Practitioner of Neuro Linguistic Programming he has made it his mission to teach those who dedicate their life to change work, the time tested techniques of Direct-Response Marketing so they can prosper and profit with their businesses while doing good in the world. That’s my picture on the side. When people ask me what I do, I say I’m an Alchemist of Desire. It’s much more fascinating than saying I’m a Direct Response Marketing Copywriter or Marketing Strategist. Also, I quickly learned not to say I’m a Copy Writer as people were constantly confused and thought I helped others ‘copyright’ their books and product logos. It’s kind of funny actually… if you had told me when I was working as a Computer Network Administrator at Cox Communications or a System Test Engineer at IBM, that I would one day make more money writing direct response sales letters… I would have said you’re crazy in the head. Yet here I am. A reformed computer ‘techy’ guy, now a highly sought after Marketing Strategy Consultant and Direct Response Copywriter for entrepreneurs. And I’m loving it. It is so gratifying to help these businesses double, triple, and even get ten fold increases in sales and profits. My unique combination of Direct Response Marketing, Copywriting, and background as a Computer Engineer gives me a very useful perspective balancing the psychology of persuasion with building and testing systems that bring in the biggest bang for the buck. It’s also why Tom Hoobyar, a member of my Mastermind group, nicknamed me ‘The Revenue Engineer’. And I have a new project underway to specifically bring my knowledge and experience with Direct Marketing to the small business owners in the Hypnosis industry. I myself am a certified Hypnotist and NLP Master Practitioner, so I understand their businesses and the challenges they face. The people who go into professional hypnosis have a powerful desire to help others in this world, but the majority struggle with bringing in enough cash flow to do it as a full time business. My goal is to show them how to get more clients through applying the time tested techniques of Direct Marketing and how to increase their revenue and profit margins by developing other streams of income related to hypnosis. I have over 100 articles, podcasts, and videos available for hypnotists all for free on this blog HypnosisMarketingTips.com. Check it out. Even if you’re not a Hypnotist, you’ll find the information useful for your business. If you want to hire me to help you explode your business growth, go to HireCraigEubanks.com to find out how to contact me, how I work, and what my current rates are. So What’s With The Dog? 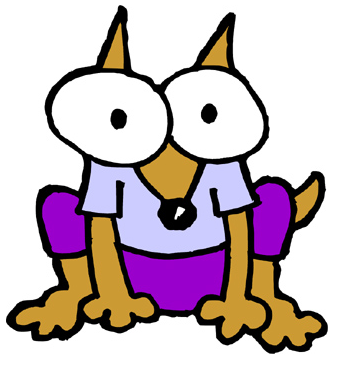 When I first saw Hypno Dog, I knew he was the perfect addition to the shirt (and later to mugs, stickers, etc.) to represent confusion resulting from bad advertising. Why a dog? I love dogs! And besides he’s wearing purple, which is my favorite color. Actually I love all critters, but I have a special connection with dogs. I always had a dog growing up and it was usually just me and the dog so I spent a lot of time with my dogs. I understand them, they seem to understand me, and there is no better way to get out of a funky mood than to have a tail wagging buddy greet you when you come in the door. I can’t have a dog where I live now in San Francisco, but I have lots of dog friends in my neighborhood, and I recently started volunteering with Rocket Dog Rescue here in the bay area. Want to own your very own Hypno Dog Mug? Just click on the mug image below and you’ll be taken to Zazzle where you can order one of these soon to be highly sought after collector’s items.